Several years ago, when I first started playing Volley & Bayonet in fact, one of the first battles I re-fought was Shiloh. Since then I have re-fought this battle a number of times with different opponents. 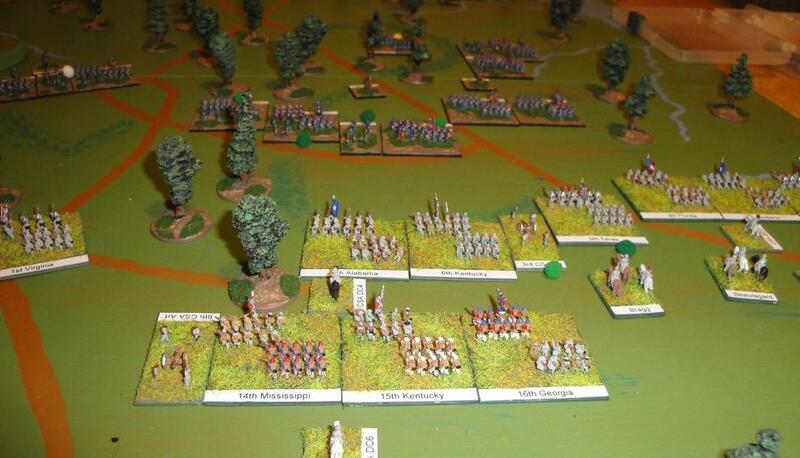 Having completed stage one of my American Civil War re-basing project, which included increasing the figures per base, it was with some anticipation that the figures took the field for Shiloh. Shiloh is for me, a particularly interesting battle for the wargames table. In part this is due to the terrain which is so different from European battlefields, being almost covered completely in woods. The impact of this terrain is that a different style of warfare is required. 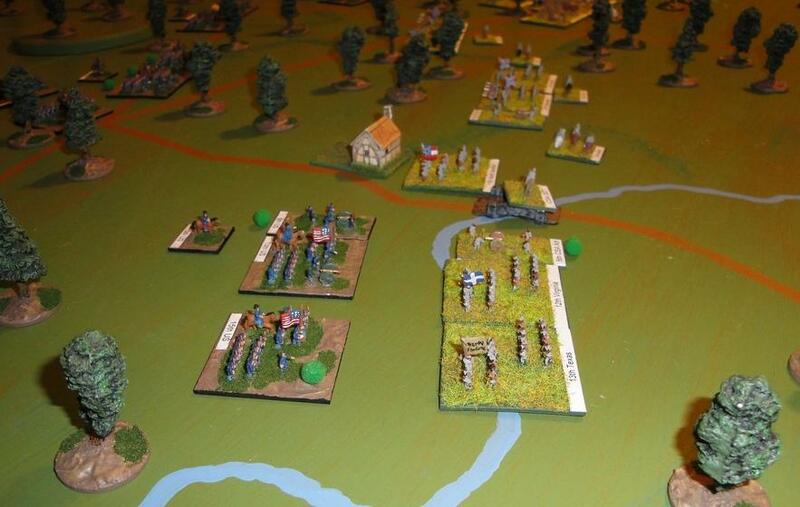 Visibility being so restricted sweeping charges are replaced with musket fire and then bloody attacks. This is complicated by green armies were movement is restricted by poor drill. However, it doesn’t end there. Shiloh was from an historical perspective a shock to the combatants. Casualties were significant and historically it set the tone for future battles of the civil war. Above, Pittsburg landing a few days after the historical battle. In our re-fight, which was to only be the first day, we used the order of battle presented in the Battles of the American Civil War scenario book. The main change was the lowering of the artillery morale values to align with the revised standards of Volley & Bayonet: Road to Glory. The Union troops were soon deployed and the Confederate commanders announced that they would adopt Johnston’s alternate plan of attack, outlined in both the scenario and the history books, rather than the historical Beauregard plan. From a game perspective the main impact Confederates would attack on a broad front and that Lew Wallace’s Union division would potentially arrive earlier. With the Confederate plan confirmed their advance was soon under-way. “Enough of this scientific soldiering. Advance with the bayonet!” Albert Sidney Johnston, 6th April 1862. Advanced Union forces were soon reacting to reports of the pickets as the Rebels pressed forward across a broad front. Hardee’s Corps, effectively a strong division, was on the left and advancing on Shiloh Church and Sherman’s Division. Sherman, rather than give ground organised his division for defence and deployed his troops to the right of the church. Hardee meanwhile, despite being under the watchful eye of Johnston, halted at Oak Creek. It seemed that the Confederate plan called for Hardee to undertake a holding action here. However, depsite not pressing his attack with his infantry his artillery advanced and began to place elements of Sherman’s division under fire. The result was devastating, and soon McDowall’s Brigade, who like many brigades in the army was raw, broke and routed, their morale shaken by the Rebel guns. Bragg’s Corps, of three divisions, pressed relentlessly forward in the centre. Opposite was Prentiss’ small Union division. Outnumbered, and likely to be outflanked, Prentiss ordered a withdrawl. Bragg’s Corps pressed on. Likewise the Rebel right, comprising Polk’s Corps made steady progress, though delayed by two creeks and a ravine that ran across their front. Simultaneously Hurlbut, commanding the Union 4th Division, had moved forward and by 9am was deploying in strength along the Sunken Road, and in particular in the area between the Eastern Corinth Road and Hamburg-Savaannah Road. To Hurlburt’s left Stuart’s Brigade would soon form and in due course be extended further by WHL Wallace’s 2nd Division which moved forward with speed. To Hurlbut’s right Prentiss and his 6th Division would soon form, while McClernand’s 1st Division extended the Union line further in the area around Woolf Field. By 10am and in the centre, elements of Bragg’s Corps reached Sarah Bell Field and were therefore now opposite the Sunken Road and Hurlbut’s main position. Above, the general position around 10am. McDowall’s Brigade is to the rear and marked with a yellow and red disorder around 10am. Sherman is on the extreme lower right and union forces stretch across the table in an arguably ragged line. Below, Rebel forces arrive at Sarah Bell Field around 10am. Hurlbut’s Division lines the Sunken Road and is now stationary. 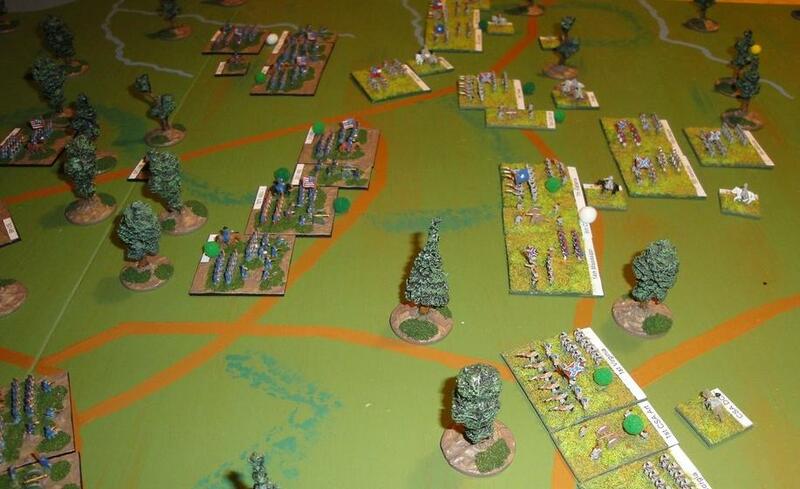 Element’s of Polk’s Corps advance on the right. The Bloody Pond is just to the right of the advanced Union brigades. Initial musketry fire was ineffective and one Rebel brigade pressed forward in an attempt to disorder the Union line frontally. Driven back other options now needed to be considered. Learning of developments in the centre Johnston now made his famous quote and urged Beauregard to conduct an all out frontal attack. “Enough of this Scientific Soldiering” he protested, “Advance with the Bayonet”. Below, another view of the forces around the Sunken Road showing Hurlbut’s position in the left foreground. Rather than follow Johnston’s urging Beauregard continued to look for a more subtle opening. Indeed, he planned to unhinge the Sunken Road position in one attack of a series of attacks. As a result over the next two hours Bragg and Beauregard fed in several additional brigades against the eastern end of the sunken road, in the general area of Bloody Pond. Alas for Beauregard, each attack failed to gain ground and was driven back despite Beauregard personally encouraging the troops, at great personal risk. Clearly the hero of Fort Sumter was in fine form! Below, Beauregard moves another brigade forward to attack the Union line around Bloody Pond, visible top centre astride the advanced Union line. Returning to the Union right, Sherman’s division continued to be badly handled by Hardee’s troops. Indeed, from 9am their position deteriorated. With the effective bombardment of Union troops by Hardee’s artillery, and Union inability to counter the Rebel guns, Hardee moved his infantry forward and the battle became general as can be seen below. The result was further Union casualties and by 11am Sherman’s division broke and routed. 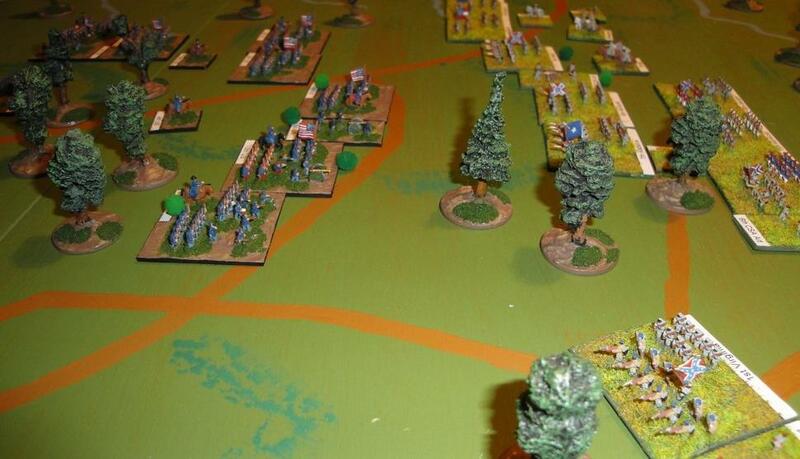 Below, Buckland’s Brigade offer a last ditch attempt to halt Hardee’s advance around Oak Creek while Rebels outflank the position near Shiloh Church. Soon Buckland’s Brigade broke and the Union right became unhinged. 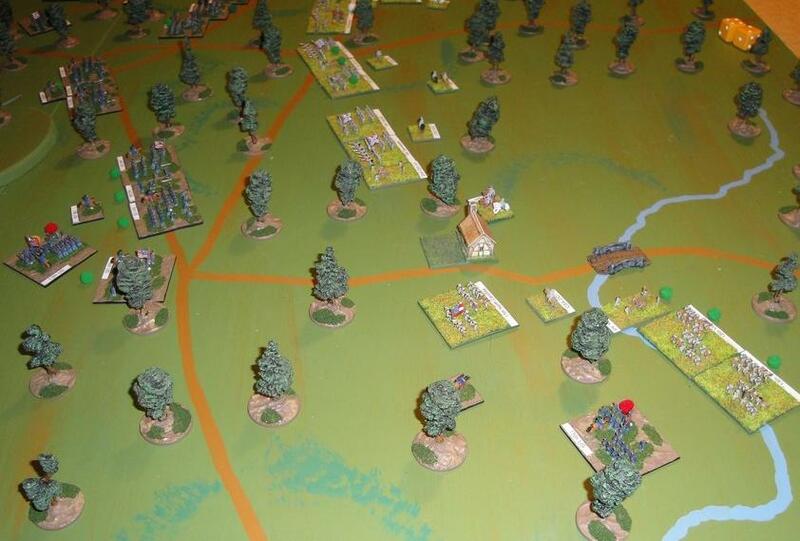 From a game perspective green markers, on two of Hardee’s Brigades indicate stationary units with increased firepower. Grant first made an appearance on the battlefield around 9am, having travelled down from Crump’s Landing to Pittsburg landing by boat. On his arrival he busied himself first with organising a second line of defence around Pittsburg Landing before moving forward rallying some routed troops on the way. Now, realising the collapse of his right, he ordered McClernard who was still not engaged, to fall back to form a new line he wanted to form along Tilman Creek. This new line which extened the positions of Prentis and Hurlbut, tough at 90 degrees to the original, was less exposed to an outflanking by Hardee’s now advancing corps. Now with Lew Wallace and his 3rd Division on hand and formed up, having first arrived around 10am, the Union line looked secure, at least for the short term. Our re-fight of Shiloh used 6mm Heroics and Ros figures mounted on half scale bases. That is each infantry base measured 1.5″ x1.5″ square. The ground scale in this half scale is 1″= 200 yards while each pair of player turns still represents an hour. The Union figures are from my own collection while the Rebels are from Jon Harding’s collection. 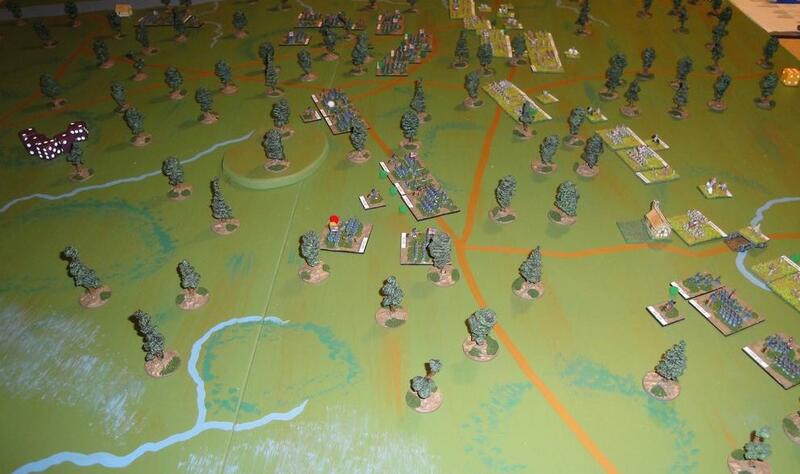 The battlefield is represented by open woods with the odd clearing maked by a green border. The artillery ratings, where any were M6, were dropped to M5. 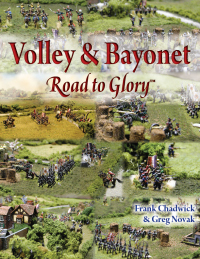 Lines of communication were defined for both armies, as required by Volley & Bayonet: Road to Glory. These were Pittsburg Landing for the Union and the Western Corinth Road for the Confederates. 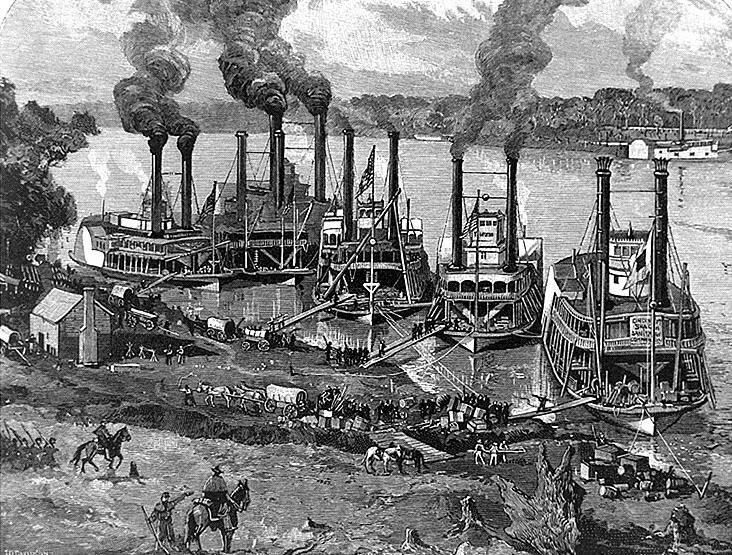 Nelson’s Division starts arriving at Pittsburg landing at 6pm one stand per hour assuming Pittsburg landing is in Union control. The remainer of Buell’s troops are deployed at night, automatically, as per the scenario. We treated the open woods as “orchards”.